I love the first Butterick pattern pic! So stylish!!! I did try to find out more about that bolero with the ruffle — no luck at CoPA, usually a good place to see the pattern layout of vintage patterns. I did find the pattern but no new information here. I found the pattern layout here: https://www.worthpoint.com/worthopedia/1930s-butterick-bolero-top-pattern-1818580771 Thanks for this lovely post, always so inspiring! What I love about the Delineator, and your sharp eyes, is the explanation of fashion changes and the ways that women could deal with the shifts. How interesting that the longer jackets were seen as a way to handle changes in the waistline! I’m still trying to understand why women who were used to the 1920’s hip band would be worried about their rear view in a dress with a natural waist! Ahhh — love handles. Reminds me of a joke I heard on TV around 1954: “My mother-in-law needs a five way stretch girdle: back, front, both sides, and a gutter on top to hold the overflow.” I’ve often thought of that myself when trying on girdles…. Not a lovely experience. Your grandmothers knew their stuff. 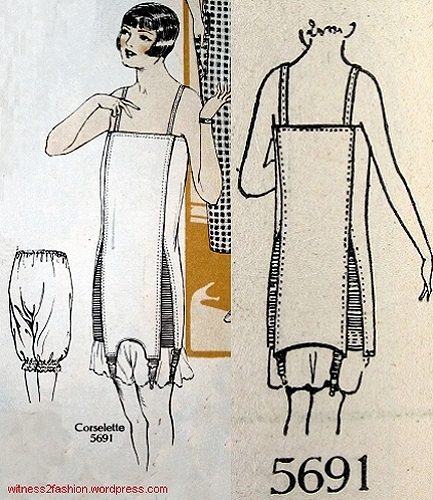 I love that you used the word “corselette,” because in the 1920s the corselette (spelled many different ways) was the long, often boneless, foundation garment that eliminated curves. In the 1930s, when a more natural figure was the goal, the invention of lastex made a smooth line from midriff to below the hip possible. Now we have “Spanx” to make us look firmer than we really are. Fashion evolution at work! (For more images of 1920s’ corselettes and the latex stretch foundations that replaces them, click here. That Bolero Jacket is stunning! My daughter would love that with a pencil skirt! I’m considering making a longer kimono style version for myself. Thanks for posting this. I get ideas, I get ideas…. Ideas, good! Creativity, good! And thank you for confirming my impression that this style looks “now.” Happy stitching! I think these are called “waterfall cardigan” these days? Now we know where they come from!